← What comes after the Millennium Development Goals? Even the tiniest signs of industrial take-off in Africa always attract the attention of economists and policymakers, both of whom are eagerly waiting for the elusive African growth miracle. One such episode of excitement was the surge of apparel exports that followed the implementation of the African Growth and Opportunity Act (AGOA) by the US in October 2000. 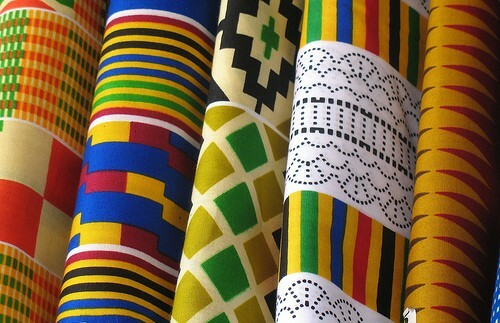 AGOA, which enabled some African countries to export over 4,000 products, including hundreds of apparel products, quota-free and duty-free to the US, is widely regarded as a trade-policy success. Yet the export surge has not survived the 2005 demise of the Multiﬁbre Agreement, when Chinese exports, no longer facing US quotas, took over, and has not been accompanied by dynamic growth beneﬁts. As seen in Figure 1, exports from AGOA’s three most successful exporters as well as AGOA as a whole peaked in 2004 and it was all downhill after that. In recent research with Lorenzo Rotunno and Zheng Wang (Rotunno et al. 2012) we argue the success was rapid but short-lived as a large share of AGOA exports were in fact Chinese exports transhipped through AGOA to circumvent now-abolished US quotas and on top benefit from duty-free treatment. The quotas imposed on Chinese exports during the Multifibre Agreement guaranteed smaller developing countries access to the US market. This implicit export subsidy for African countries, coupled with AGOA preferences, was thus a golden opportunity for African apparel exporters. Yet, a key feature of the AGOA preferences was the absence of rules of origin, which are usually imposed under trade agreements to avoid transhipment. This meant that African exporters could use inputs from any country, in any proportion, as long as some assembly work took place in Africa. It thus provided an opportunity for Chinese exporters to merely tranship their products via “screwdriver plants” in Africa, avoiding US quotas and on top beneﬁtting from AGOA preferences. The end of the quotas on Chinese exports rendered the transhipment unnecessary and thus led to the departure of footloose factories and the fall of AGOA exports. The suspicion that AGOA and US quotas on Chinese exports spurred a Chinese manufacturing wave in Africa has been all over the news. Chinese and Taiwanese producers formed the bulk of a textile “diaspora” in Lesotho, Madagascar, and Kenya. In the Kenyan Export Processing Zone, 80% of the 34 garment plants had Asian owners. What’s more, the inputs of apparel ﬁrms in Africa were most-often Chinese. For example, Lesotho ﬁrms typically provide assembly, packaging and shipping services and depend on their Asian headquarters to send them the fabric they need. We go further than the anecdotal evidence by empirically tracing the transhipment from China to the US via Africa. More precisely, we show that Chinese apparel exports to AGOA countries predict these countries’ exports to the US. To show that this correlation, which we label transhipment elasticity, indeed captures transhipment, we show it only holds in countries which didn’t face any rules of origin within AGOA, and only for products bound by US quotas on Chinese exports. 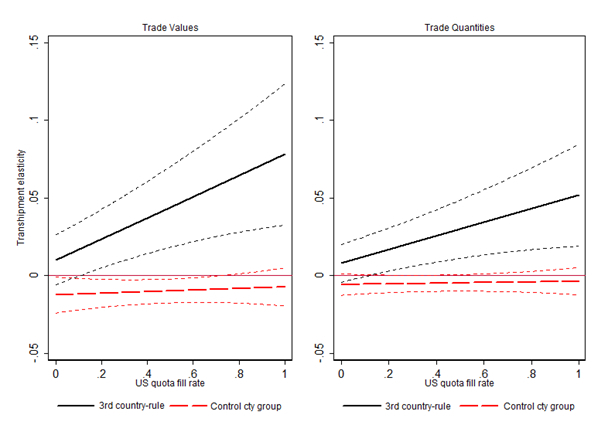 In other words we ﬁnd traces of transhipment only where incentives were highest, i.e. in quota-bound products, and in countries where it was legally possible to do so. This is illustrated in Figure 2 which shows how the transhipment elasticity varies with the quota fill rates, a measure of quota bindingness, and across countries. In countries not facing any rules of origin, i.e. where transhipment was possible, we find a positive elasticity that increases significantly with the bindingness of the quotas (blue line). But in AGOA countries non-eligible for the apparel provision, or in those facing rules of origin, such as in apparel-exporting South Africa and Mauritius, we find no significant transhipment elasticity (red line). 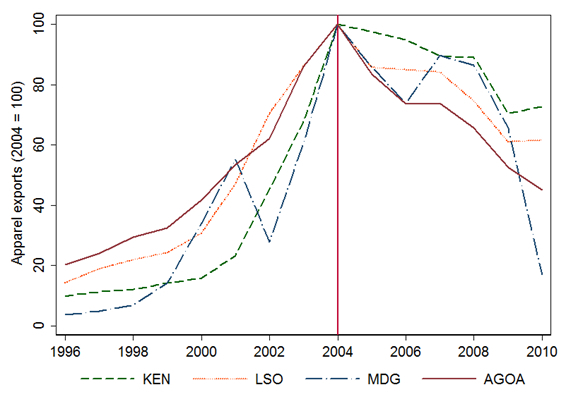 In a nutshell, our research provides evidence on the unintended consequences of economic policies, here the transhipment that resulted from the combination of US quotas against China and unrestricted preferences for Africa. This transhipment explains the surprisingly fast and robust impact AGOA had on apparel exports to the US. Back-of-the-envelope calculations suggest that the policy combination may account for as much as 64% of Botswana’s apparel exports, 45% of Kenya’s, 35% of Madagascar’s, and 23% of Lesotho’s. Yet this rapid rise and fall warns that supply-chain industrialisation may lead to fast growth but can have limited spillovers and comes with the risk of further re-locations of production. Development-focused trade policies should thus pay special attention to the fickleness of production fragmentation. This entry was posted in Institutions and Growth, Jobs, Finance and Skills, Policies to Protect the Poor and tagged Exports, Firms, Trade. Bookmark the permalink.